Seminole County has Title X (Ten) funding available for vasectomy for men who qualify based on income and family size. 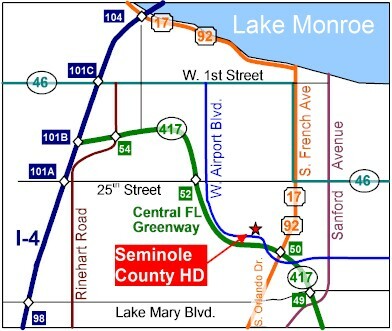 The Seminole County Health Department is conveniently located right off the Central Florida Greenway (417) on Airport Boulevard. Take either Exit 50 or Exit 52. From Casselberry and Fern Park, you may also also come directly north on US 17/92. After counseling and financial screening at the Sanford location of the Seminole CHD, vasectomies are performed by Drs. Doug Stein and John Curington at Planned Parenthood of Greater Orlando, at BVL Family Medical Center in Kissimmee, and at Wisdo Family Medicine in Ocala. Drs. Stein and Curington use a no-needle no-scalpel technique. See their schedule for dates at each location. If you do not qualify for financial assistance, the fee is $590.